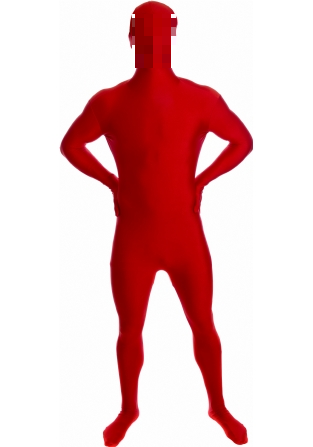 SCP-905 posing in front of a white backdrop, turned to a red hue. Special Containment Procedures: SCP-905 is to be contained in a six (6) m x six (6) m x three (3) m containment cell, painted matte black. This cell is to be devoid of any mirrors or windows. Two LED arrays are to be installed in cells housing SCP-905. Every four hours, SCP-905 is to be fed for twenty (20) minutes. As of current regulations on "Misters", SCP-905 is to be contained in Hall ██ of Site-██. Description: SCP-905 is a sentient entity composed of photons. These photons form a humanoid shape that has been described as “fuzzy, but definite”. It is roughly 1.75 m tall; however, its mass is immeasurable. SCP-905 has shown the ability to speak through the manipulation of air particles, but its mechanism to perform this is unknown. SCP-905 is capable of the same movement as a human male of the same body structure, but due to its photonic nature, is unable to manipulate solid objects aside from emitting weak electromagnetic radiation. Solids such as doors must be moved for SCP-905 before it can leave or enter a room. SCP-905 has the ability to pass through windows and other transparent objects. The photons SCP-905 is composed of follow the usual laws of probability in this case, and will reflect back from the transparent object at a rate of ~5%, separating any reflected photon from SCP-905's influence. SCP-905 describes this as painful but bearable. SCP-905 sheds its photons at a constant rate of approximately 0.001% of its body volume per second. These photons are emitted at a wavelength of ~380 nm to ~780 nm, or within the human spectrum of visible light. SCP-905 shows the ability to change the wavelengths emitted to match its background. SCP-905's lack of a shadow can make detecting SCP-905 while hidden problematic. SCP-905 shows an inability to absorb coloured lights. Due to SCP-905's constant loss of photons, SCP-905 must be "fed" regularly in order to maintain a "healthy" body volume. SCP-905 was discovered at the [DATA EXPUNGED] entrance of Site-██. Addendum 905-1: The words "Mr. Chameleon, from Little Misters ® by Dr. Wondertainment" are printed upon SCP-905's left "calf". SCP-905 shows an inability to change the wavelength emitted by this print. This designation appears as "1" in Document SCP-909-a.